This is what he shirt will look like. Might be doing a second color for the sun and shrimp. $15 each: Please let me know quantity and sizes ASAP! We need your orders. Even if you have told Laura, please let me know as I am doing the quantity and she’s doing the quality. Hope you are all having a happy and healthy 2016. The reunion is scheduled for June 9-12, 2016. Please send the registration back to us by May 1st, if possible. We do not want registration funds until the reunion, but we do need to get an estimate of how many folks to expect for all 3 nights. If you can’t get the form to work, just send us an email with your name(s) and how many are planning to attend each night (Thursday-gumbo, Friday-beach cook-out, Saturday-shrimp). 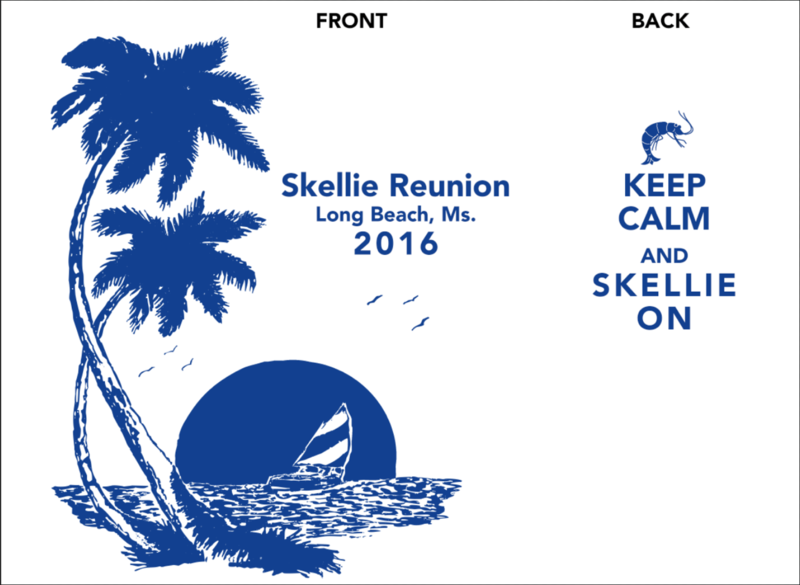 We will collect registration and any other Skellie Fund donations in Long Beach. As in the past, Marilyn & Tony have invited us to their home for swimming and gumbo on Thursday afternoon/evening. We are trying something new (actually going back to our past somewhat) on Friday and plan to have a hamburger and hotdog cook-out at the Long Beach Pavilion on the beach near the Long Beach Harbor, and Saturday will be our traditional shrimp boil at the Long Beach Senior Center. Also, Holiday Inn Express in Long Beach is accepting your reservations. I spoke with them this morning and know many of you have made your reservations. If you haven’t done this yet, please do it soon to take advantage of our group rate. They have offered us a group discounted rate of $119.95 (plus tax) per night. To get this rate, please make your reservation by phone by May 9th. Their direct number is (228) 864-5440. We are using the most recent updated email list we have, so if you know of incorrect email addresses, please let us know. Also, if you know of someone that is not on the list, forward this link to them and let us know that too so we can add them to future mailings. If you need to contact us, the best way is email. At long last the regimental history for Grandpa Bethea‘s Civil War unit is at the publisher’s and will be available soon. It is hard to believe that this weekend research project has taken 12 years to complete; but we are ready to take requests for the two volume set. The present size is over 800 total pages. Plans are to include a 100 page roster with each book. I hope to have copies at the Skellie Reunion, at least final proofs. For those of you interested in reserving a set, please let me know that you will commit to covering printing costs of $35.00 for the set. The final price will not be determined until after all photography, cover art, and layout are completed. We estimate the two volume set will sell for $50.00+ plus shipping. We will be offering volume discounts and can have special printings for large group (Family) purchases. Donations to libraries and schools will also be considered. Feel free to share this with other 7th Mississippi Connections and any message boards you use that cover the Civil War, Family history, and Mississippi. Click buy now below and select the number of copies you want to reserve. Include your mailing address and phone number in case we have questions. DO NOT SEND CASH, CHECKS, OR CREDIT CARD NUMBERS. 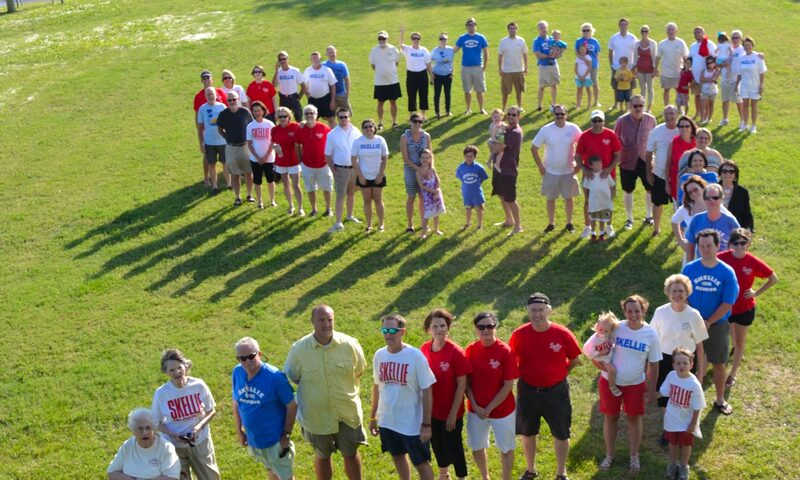 Deb G Wilson and Brian Skellie have been kind enough to update the Skellie Family Directory, and are working on the 2012 Edition! I realize with this size of our family and “fluidity” of housing, email addresses, etc., it probably already needs updating! So…if you find errors, send me your corrections and I will send out periodic updates! Marilyn and I have been working on the reunion. Will have notices for all of you very soon! Take care and love to all!